The Ambassadors started out as The Seven Dwarfs (who recorded Stop Girl), but the keyboard player and singer Sharon Herr left and I was brought in to replace her. I had been playing in a series of bands with Don in The Magic MonoRays ( a cool name ) the Trannells (Blessed With A Love), with Bill Parmer and a bunch of black guys and The Chevells...car names were cool. No one was really doing much with horns, but the Motown sound was our thing, so we added horns and became The Ambassadors. We played everywhere including all black clubs and some people referred to us as "Blue Eyed Soulboys" We opened for many top acts: The Four Tops and Smokey being the best. We played with Booker T and the MG's and we did a version of "Green Onions" that arguably sounded better because we had more guys and a bigger sound, Booker was not impressed that we sounded better than his band. With the Seven Dwarfs, we opened for the Kingsmen in 1963 ( I was 15 at the time and this was my first big job) when " Louie Louie" was high on the charts. 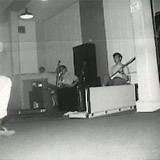 The night of the gig it rained extremely hard and my cheap Silvertone transistor organ was drenched and failed to play. The keyboard guy of the Kingsmen let me play his Hammond B-3 and with its' big Leslie speaker, people could feel the presence of the keyboard. It was then that I realized that in blues, rock or whatever was being played, the Hammond could and should be out front.. in full concert with all other players, but capable of being a lead instrument. i.e. Pork Chops and Too Young For Me are good examples. Here are the black & white shots from the " Too Much of a Good Thing " session in Philadelphia. 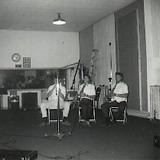 The first shot is of bass player, Bill Parmer and in the box, drummer Bobby Bitts. 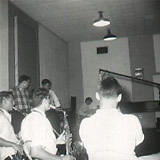 Shot two is the horns, Bob Weaver and Mike Sultzbach on sax and Tony Purcell on trumpet.Shot three is horns, singers, Don Hodgen, Rick Reardon and me on piano ( I usually played the Hammond, but liked the piano more for this session...more percussive for dance music) Shot four shows bass, Eric Spitzer on guitar ( Eric and I wrote the song, we also wrote Too Young for Me and I Want a Love, which I don't have, but it is a great ballad...it's on some bootleg stuff and a compilation or two so if you run across it please grab me any format you can find ) and drums. Shot five is a similar shot to number three. Number six...playing around... Bob beating on my head...the guy in the dark shirt is not a band member, but is a famous author, Tom Flannery...he took the shots. Number seven is Pancho Villa and me . Pancho owned the label, hence Pee Vee. He was a good guy, but a bad businessman, went bankrupt and is deceased. We played with Dan Hartman ( he played bass for Edgar Winter writing Free Ride and I Can Dream About You) who had a band "The Legends" (" Rock N Roll Hootchie Coo")... quite often. Dan was the best, but succomed to HIV a few years ago. We were the house band along with the Legends and The Magnificent Men at a club called The Raven in Harrisburg PA and opened for a lot more Motown acts, but I can't remember all the bands.Sometimes we even played the music for their sets. Like many bands we changed personnel." 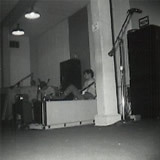 Too young for me" featured Lennie Clawges on vocal and Jimmy Hoar ( who wrote Porkchops) on drums. 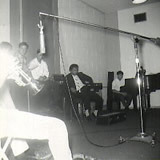 Jimmy was a studio musician ...he played on Rescue Me for Fontella Bass, the Beach Boys, and countless others.Lennie was a tough who kept up ending in jail and died quite early. Well that's a brief story. Gotta run. Hope you didn't get bored by all this.